The hunt for unnecessary waste continues! In the rooms, STOP the welcoming mineral water system, waste generator! It’s been 15 years that we are loyal to our mineral water supplier but … times are changing! And, dear Guests, you often mentioned to us that it was an not-ecological habit in our ecolabel hotel. 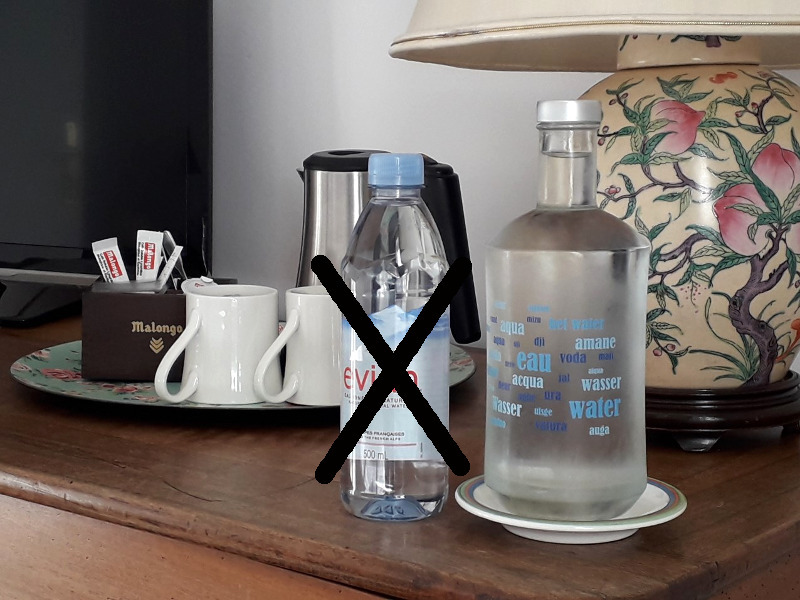 So, for your welcome in the room, to avoid plastic waste, we set up a rotation of carafes of fresh tap water placed, very fresh, in the room, at the time of your arrival. This is renewed every day for stays of several nights and if you need, more can be given to you at your convenience at the reception during your stay. In fact a even better service than before! An example of what drives us every day: finding more virtuous solutions to our operation without penalizing your comfort or the quality of our service.